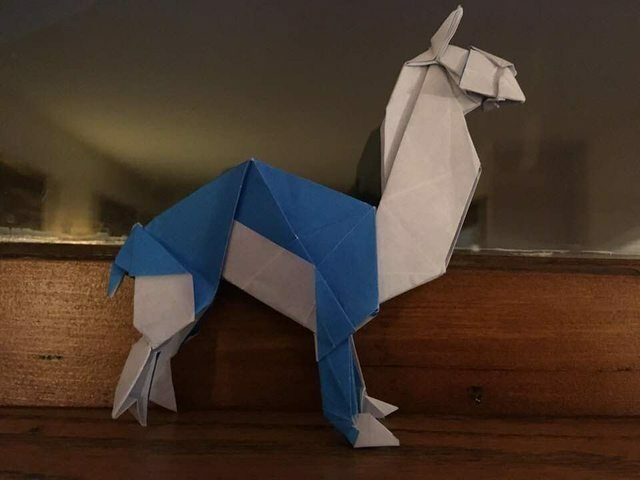 I have done pretty well so far on this model (Llama or "Lama" from Tanteidan 19 by Fumiakai Kawahata), but I am getting stuck on step 99/100. The diagram does not seem to QUITE match any perspective on the model. I also can't read Japanese, so that may be contributing to my confusion (though like I said, I've done fine up to this point). I tried to just move past that step and see if something else helps it make sense down the line, but that didn't work either and I got stuck again on steps 107/108. If anyone here can translate the Japanese, or has done the model before and can give me a few helping words to get through those steps mentioned above it would be much appreciated. I have included a link to some images/diagrams. Please help this llama stop spitting on me!!! Last edited by PhizzFan on March 2nd, 2018, 5:47 pm, edited 1 time in total. 99-100 look to be a back view of 98, but it's hard to help you further without more context. Regardless, I hope what I said helps at least a little. I'll provide a rough translation, if it can help you. "Fold to the other side (i.e., fold back; mountain fold)"
"View of 98 from inside"
I can't help with the folding (I don't have access to the book right now), but it looks like a reverse fold on the leg. The reversed part is only on the top, as viewed from step 99 with the mountain fold. "Intermediate view 1 (i.e., previous step is being done)"
I believed I had understood the second part (107-108) although the photos franz posted look different, so I will double check. I have figured out the issue I was having with steps 98-99. The issue was (of course ) with step 97. I made a simple mountain and valley fold instead of a "two-sided" crimp (?) fold as indicated in 97. Not sure if I am saying that right, I hope it is understood. PhizzFan wrote: I made a simple mountain and valley fold instead of a "two-sided" crimp (?) fold as indicated in 97. Not sure if I am saying that right, I hope it is understood. It is just called a crimp fold, since there is no such thing as a one sided crimp since a crimp fold is a sequence of two reverse folds. The mountain and valley that you did is called a pleat. So you would say that you accidentally performed a pleat instead of a crimp. Thank you DavidW and others for help with the language and the folding! I sort of blundered through last time and it all worked out... but I don't know the reference points. I can see from the diagram the folds reach the mid-line, and I THOUGHT the bottom edges were supposed to be horizontal (perpendicular to mid-line), but the model doesn't look quite like the diagram in that case. "Check the amount to fold on next picture"
But the reference is clear: the left and right inclined edges are to be horizontal after you fold the corners - perhaps the arrow at the bottom-right of step 68 picture is made to show that important horizontal line.